Operation ENOGGERA was conducted between the 21st June, 1966, and the 5th July, 1966. 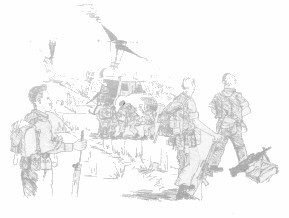 This was the first Battalion operation. It was also a first for the First Australian Task Force, being an operation under-taken solely by us in Vietnam. 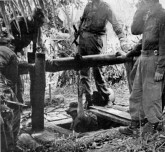 Our task was to search the village of Long Phuoc about 2000 metres southwest of the Task Force Base, clear it of any Viet Cong and confiscate any caches of materials found. The destruction of any tunnels and caches and, in fact, the entire village, was also to be implemented. Long Phuoc had been a well-established village with brick houses and many cultivated areas bounded by hedgerows. The enemy met were only small groups of local forces. Contacts were made with snipers and groups of up to four men. The Armoured Personnel Carriers and the helicopters of 9 Sqn RAAF supported the battalion by back-loading the rice and other materials found, apart from resupplying the troops in the field. Some months after the operation the Government of the Republic of Vietnam gazetted that Long Phouc no longer existed, and its name was removed from official records of existing communities. 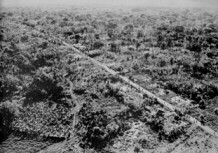 49 tons of rice-15 tunnels-9 tons of rice-11 weapons-medical supplies-documents-clothing-ammunition and explosives-panji stakes.